Actress Park Shin Hye surprises the cast of Running Man with dance skills comparable to that of Korean girl idol groups. On October 1, the cast of SBS upcoming Wednesday-Thursday drama The Inheritors was spotted filming for variety show Running Man at SBS Broadcasting Center in Mokdong, Seoul. The filming was done exactly nine days prior to the 1st episode premiere of The Inheritors. Park Shin Hye, Kim Woo Bin and Choi Jin Hyuk from The Inheritors were keen to challenge the Running Man cast in a final showdown - 'Heirs Race' - to determine who would be the true heir. All participants in the heirs race had to perform a variety of missions in the race to demonstrate their eligibility to become the true heir. In particular, Park Shin Hye surprised everyone with her dance skills which are as good as professional girl groups. She rendered everyone speechless with her superb dancing and captured the hearts of members of Running Man. On the other hand, Kim Woo Bin and Choi Jin Hyuk actively played in a wrestling mission. 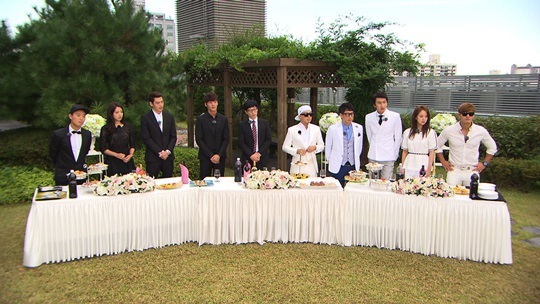 This episode of Running Man featuring The Inheritors cast will air on October 6 2013 at 6:10pm (KST).